In this episode, the guys caught up with recent NHRA U.S. National Super Gas champion (and current Super Gas points leader) Devin Isenhower to recap the biggest win of his young career. That leads their in-depth coverage of the Big Go, and some of the stories of note from the fabled event. 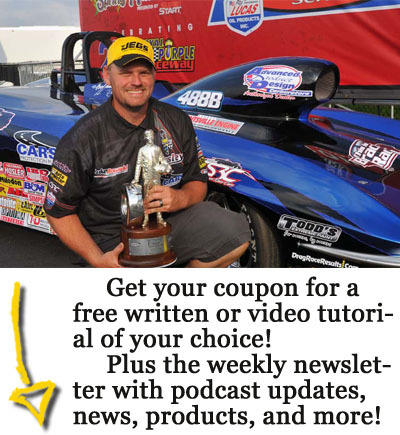 Lead (only) Sportsman Drag Racing Podcast correspondent JJ Pennington provided his Top 10 for the month of August, and the guys closed the show with a pair of epic Racer Confidential stories. Previous Previous post: Episode 092: The Year of the Bottom Bulber Continues!